With these words, Frédéric Mitterrand, the Minister of Culture, began on Thursday 26th January his tribute to perfumers. Indeed, the Ministry of Culture which has existed since 1959 acknowledges for the first time that perfume, one of the most prestigious French products in the world, is also an art form. This event, which emphasised the great tradition of French perfumery by promoting its craftsmen, highlighted the perfumers, these artists whose names are too often ignored by brands, not to mention the general public. «Perfume has its place in the Ministry of Culture. Today, I intend to honour the perfumers-creators as well as the great tradition of French perfumery. Until lately, the art of perfumery was essentially French; presently more of two thirds ofperfume composers are French. Yet these artists of scents are hidden behind the brands and, in most cases, don’t get the recognition they deserve. Thanks to this exhibition at the Palais Royal dedicated to perfumers and to their know-how,…, the Ministry of Culture and Communication wants to give recognition to an eminently creative and cultural industry. I wish that just like the intelligence of the hand is, the intelligence of the nose will be considered as an art form. Because perfumers are actors of the French cultural inheritance, we need to support them so that the transmission of their know-how will be ensured and perpetuated as well as their creative freedom. Whether they are independent or committed to perfume houses or to luxury brand, perfumers have a full place in the French cultural landscape…. » Extracts of the speech of Frédéric Mitterrand. 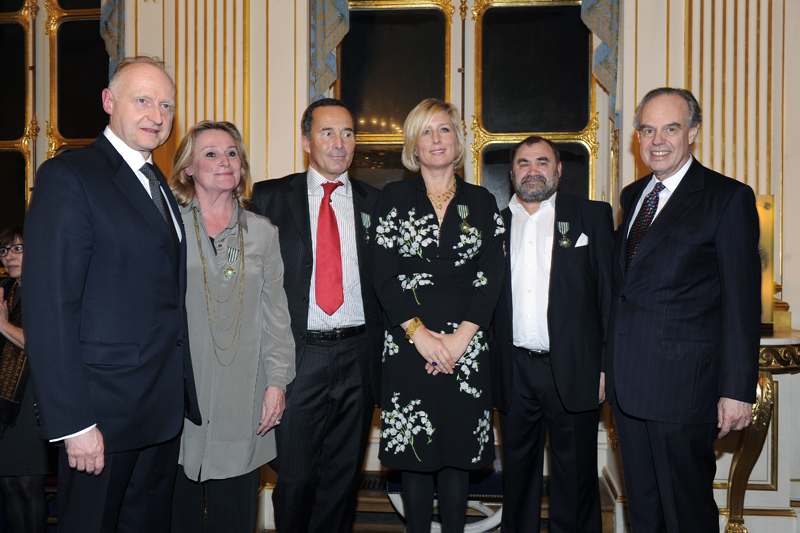 On this occasion, Frédéric Mitterrand awarded five perfumers from well-known houses of perfume the insignia of « Chevaliers des Arts et des Lettres ». It was an opportunity to pay a tribute to their talent but also to the know-how of all perfumers. The French society of perfumers, who has been working for such a long time in this regard, was particularly proud of this first step in recognising the perfume creation as an art form. . This evening also launched the exhibition dedicated to perfumers-creators and to their know-how, which opens a window on our work to the general public.